Beside having some great natural attractions like rivers and mountains, Indonesia also has other natural spots, like the lakes. The lakes in Indonesia already famous for their beauty, which is rarely found somewhere else in the world. However, do you know how many natural lakes in Indonesia? Indonesia apparently has about 500 natural lakes. So many, don’t you think? Well, from those hundreds of lakes, which lake is the largest? Here’s a list of 15 largest lakes in Indonesia that you should know. Check it out ! 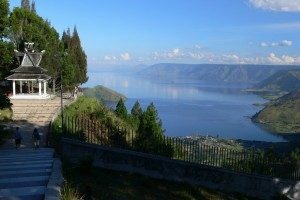 Lake Toba is the largest lake in Indonesia as well as Indonesia’s most famous lake to the world. Located in North Sumatra, this beautiful lake has an area of ​​approximately 1130 sq km to be crowned as the largest lake in Indonesia. 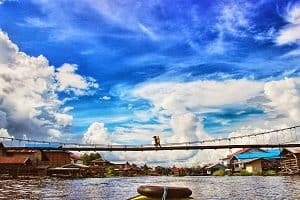 In addition to its famous size, this lake is also famous for its beauty, so it managed to become one of the most popular tourist attractions in Indonesia. This volcanic lake which is formed from volcanic activity has a maximum depth of 529 meters and in the middle of it, there is an island famous for its fertility called Samosir Island. Located in South Sulawesi, Lake Towuti is a tectonic lake formed by the shift of the earth’s plate. This lake is known as Lake Towuti because it is located in Towuti, East Luwu, South Sulawesi. 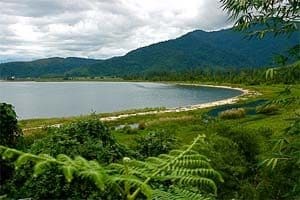 With an area of ​​561 square km and a water depth of 203 meters, Lake Towuti becomes part of Lake Towuti Nature Park which is under the supervision of Natural Resources Conservation Center (BKSDA) South Sulawesi, Ministry of Forestry Republic of Indonesia. Lake Towuti area has its own charm as a tourist destination of South Sulawesi with beautiful natural ecosystem is still clear, and interesting vegetation of various types of orchids that add to the beauty of Lake Towuti. You can take a look around and watch the scenic beauty of Lake Towuti by boat or speed boat. The next largest lake in Indonesia is Lake Poso which is located in Central Sulawesi. With an area of ​​323 square km and a depth of 450 meters, this lake is ranked third largest lake in Indonesia. 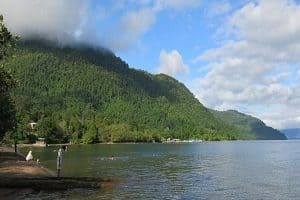 Lake Poso which is a tectonic lake is also known as a tourist destination that is in great demand of tourists so there are many hotels and inns around the lake as a supporter of the tourism activities. Lake Poso offers beautiful views of the lake surrounded by hills and woods, so the most suitable activity here is to watch the landscape while enjoying the cool air. Lake Sentarum which has an area of ​​275 km square and a depth of about 8 meters is located in West Kalimantan. Located in the heart of Borneo, Lake Sentarum area has been designated as Danau Sentarum National Park (TNDS) since 1999. Located about 700 km northeast of Pontianak City, TNDS consists of 43,000 hectares of land and 89,000 hectares of swamp forest. Unlike the other lakes, Lake Sentarum is a flood-prone area located in the middle of the mountain. When the rainy season arrives, the area of ​​Lake Sentarum will be submerged due to the swift rain and the flow of the Kapuas River. Uniquely, when the long dry season arrives, most of Lake Sentarum will become dry. Lake Matano is a natural lake located in South Sulawesi. Located at the southern tip of Sulawesi island, East Luwu regency, Matano Lake has an area of ​​about 164 square km. 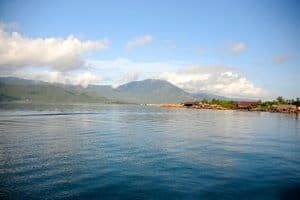 In addition to getting the title as one of the largest lake in Indonesia, Lake Matano is also known as the deepest lake in Indonesia because it has a depth of 590 meters. In addition, it turns out this lake is also included in the list of the top 10 world’s deepest lake. 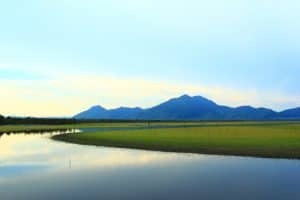 Lake Matano is a tectonic lake that the process of its formation is not from a combination of several rivers but occurs from the formation of many springs so that the water there is very clear. 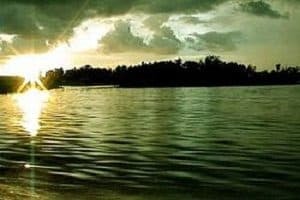 Located in the province of East Kalimantan, Lake Jempang is also one of the largest lakes in Indonesia with an area of ​​150 square km and a depth of between 7 to 8 meters. Lake Jempang is not a tectonic lake but includes a flood plain lake. The lake which is located in the flow of the Mahakam River has a beautiful natural panorama and also rich in flora and fauna. It succeeded in making Lake Jempang as one of the leading tourist destinations of East Kalimantan. Paniai Lake located in West Papua, Paniai Regency has an area of ​​145 sq. Km and a depth of 50 meters making it one of the largest lakes in Indonesia. The presence of sand and rocks at the edge of the lake and the cliffs that surround the lake adding the beauty and attractiveness for tourists to visit Lake Paniai. Thus, it has great potential as a leading tourist destination in Paniai, Lake Paniai is expected to has increasing rate of the visits of tourists both domestic and foreign. Just like Paniai Lake, Rombebai Lake is also located in Papua. The lake, which has a total area of ​​137 sq km, is formed from a river stream that floods and covers the ground. 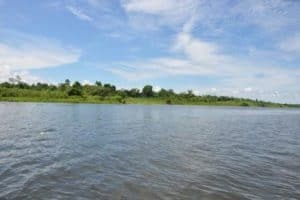 The lake is located in the east of the flow of the Mamberamo River also has the potential of natural wealth which is quite abundant with the presence of natural gas around the Mamberamo River. Those natural gas block is managed by an oil and gas exploration company headquartered in Australia. With a unique name that is the name of one of Indonesia’s special foods rich in protein and made from soybeans, Lake Tempe is exist in South Sulawesi. Located in Tempe District, Lake Tempe has a wide variety of freshwater fish species that are rarely found elsewhere as they are located on the Asian continental plates and Australia. The lake is a tectonic lake with a depth of 5 meters and an area of ​​130 km square is very unique because there are many local people who live on the surface of the lake by using a floating stage house. In addition to its beauty, the residential area is also a major attraction for tourists to visit Tempe Lake. 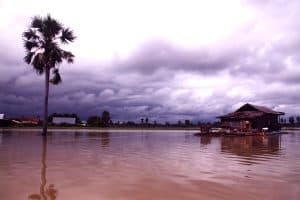 Semayang Lake is a lake located in flood-prone areas and has an area of ​​130 sq. Km. Located in East Kalimantan, this lake has its own uniqueness because of the floating village as well as Lake Tempe. The residents of Lake Semayang use boats as a means of transportation to move from one place to another. They do not know two-wheeled vehicles or cars as a means of transportation. Surely it is a special attraction for tourists to visit this lake. Lake Sentani is the largest lake in Papua which is also the most famous tourist destination on the bird-shaped island. Sentani is also the location of the popular Sentani festival in Papua. 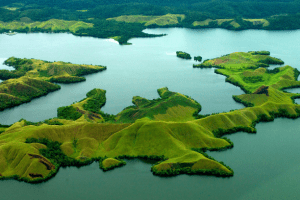 Sentani Lake lies below the slopes of the Nature Reserve range of about 245,000 hectares. Meanwhile, this lake lies between Jayapura City and Jayapura Regency, Papua. 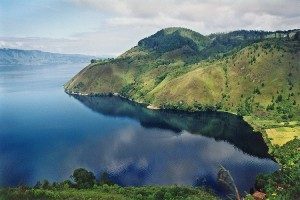 Lake Sentani has an area of ​​about 9,360 hectares and is located at an altitude of 75 mdpl, make it the largest lake in Papua. Singkarak Lake is a tectonic lake located in Solok District and Tanah Datar, West Sumatra is at a 362 m above sea level. Lake Singkarak has a length of 21 km, width of 7 km, with a surface area of ​​107.8 km2. Maximum depth reaches 268 meters with water volume reaches 16.1 km3. Ranau Lake is the largest site in Indonesia (based on air volume). This volcanic lake is located in Lampung district (Lampung) and South Ogan Komering Ulu district (South Sumatera). Located at 540 meters, this lake has a length of 16 km, a width of 8 km, a surface area of ​​125.9 km2, a maximum depth of 229 meters, and air volume reaches 21.95 km3. Maninjau Lake is a lake in Tanjung Raya subdistrict, Agam regency, West Sumatra province, Indonesia. 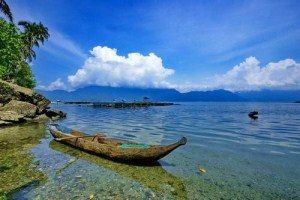 The lake is located about 140 kilometers north of Padang City, the capital of West Sumatra, 36 kilometers from Bukittinggi, and 27 kilometers from Lubuk Basung, the capital of Agam Regency. Maninjau which is a volcanic lake is located at an altitude of 461.50 meters above sea level. The Maninjau area is approximately 99.5 km² and has a maximum depth of 495 meters. The basin is formed by a mountain eruption called Sitinjau (according to local legend), it can be seen from the form of a hill around the lake that resembles like a wall. Lake Sembuluh is the largest lake in Central Kalimantan with an area of ​​7,832.5 ha and has a length of 35.68 km. Around the lake which reaches 2,424 square kilometers there are several villages, namely Sembuluh I, Sembuluh II, Bangkal and Terawan. To reach the lake from Palangkaraya, the capital of Central Kalimantan, you can use the land transporations as far as 240 km to Sampit, and from Sampit to Bangkal Village for about 80 km. From Bangkal Village, Lake Sembuluh can be reached by motor boat about 20 minutes. And that’s it, all you need to know about the 15 largest lakes in Indonesia. Well if you just near the area of those rivers, don’t forget to come there to check them by yourself. You must feel the greatness of them, yourself. Okay, enjoy it and have a great day !